The other week I lucked out and was able to head north to Philadelphia to catch the Pavement show and eat some rockin’ food. All my other trips to Philly have been bike-food oriented, and I’ve always just crashed on random folks’ couches, so this time–a trip with a hotel booked downtown, an amazing reunion show to catch, and cocktails and something other than Gianna’s vegan cheesesteak–was a nice switch-up. When we got to Philly, we first met up with G’s friends from back in the day at the Mutter Museum. Don’t worry, I didn’t take any photos. The Mutter is…well…it’s interesting? As a working museum (i.e. a real research institution for the College of Physicians of Philadelphia) it’s different and more palatable than something like the Bodies exhibit is (I would imagine, at least). But it’s still pretty hard to just walk around and look at fetuses in jars or tumors sliced up and on display. Interesting but, for someone who has a high regard for life in its living form, hard. Somehow we managed to eat afterward–Korean, yay! (no pictures–and then, after settling in at the hotel, we piled in someone’s minivan and headed over to the Mann Center for the show. Holy awesome show. I’d never seen Pavement live before, and the chance to see them during their reunion tour was great–the energy was intense, everyone was so into it, so happy to be back together seeing their favorite band. I personally like going to shows where I don’t know the bands well because then I can experience it through everyone else. I definitely wish I’d been able to see them when they were originally together, I’m definitely jealous of G & his friends in that regard. After the show we got a few beers and nibbles at Monk’s (mmm Belgian beer! ), then hit the hay. In the morning we walked towards Northern Liberties (my favorite neighborhood area in the city) and got an **amazing** brunch at Cafe Lift. First of all, the space is beautiful in a light-filled, industrial way: a lot of metal, huge windows, concrete. It’s a good way to wake up in the morning, actually. And their coffee–good heavens it was good stuff. G & I split two dishes. 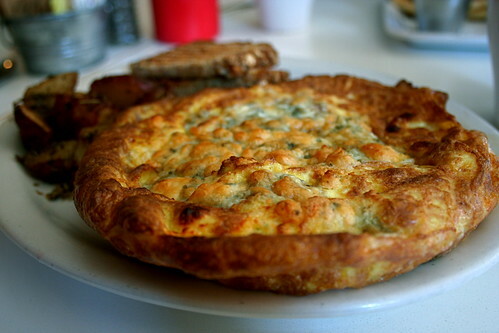 First off was the Fritatta special with spicy italian sausage & gorgonzola cheese. Super super good. The spicy sausage contrasted nicely with the punch of the gorgonzola, and the side of potatoes was phenomenal. I was fighting G for those–I could have eaten 100 of them. 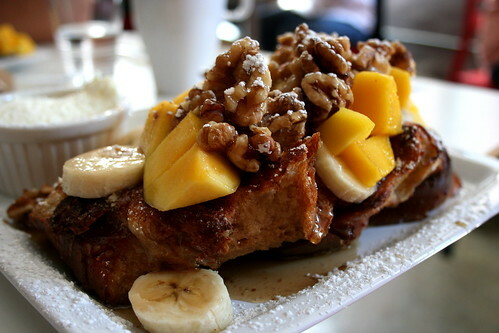 The other dish was the french toast special of the day with mango, bananas, and pecans. Nom. I would have never thought to put mango on french toast, but I’m glad they did because it was excellent. The custard on the toast was perfectly seared and not too eggy, not too sweet; the in-house whipped cream was a nice sweet touch. Cafe Lift, I’m digging you. After brunch and after G’s friends headed back to their “real lives,” we headed back out to explore Philadelphia. My friend’s dad had a photography exhibit up at the Constitution Center, so we decided to check that out, and while the exhibit was nifty–a shared project between a school in Philadelphia and a school in Afghanistan–the rest of the Constitution Center made me itchy with freedom. Nothing against the US of A and it’s freedom-tastic heritage…but, really, I can only take so much American history. 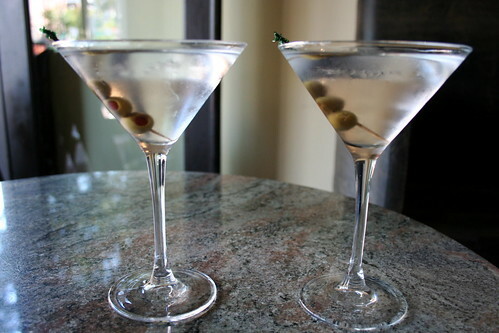 So, naturally, we refreshed ourselves with a few dirty martinis. Mmm gin. Thank god for gin. It makes me like America again for sure. After that we put on some dressier shirts and headed over to the highlight of the trip–Village Whiskey. If you don’t know this already about me, I love cocktails–good cocktails–with a passion. I love cocktails with whiskey even more. And I dearly miss my spots in Atlanta–Holeman & Finch, Abbatoir, etc. 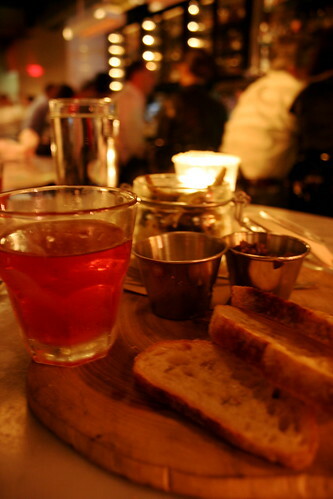 So when researching where I wanted to go in Philly–somewhere with cocktails & sustainably sourced fancy meats–Village Whiskey was the clear winner. There’s just something about a cockatil menu based solely on whiskey–sazeracs, jack roses, de rigueurs–as well as in-house pickles, burgers featuring foie gras, and duck fat fries, that makes me want to weep for joy. First off, the place is beautiful–dark wood, leather, bottles and bottles of whiskey behind the bar–but the drinks, oh the drinks. I feel like swooning now, thinking about them. We started with two Jack Roses–bottle in bond apple brandy, house grenadine, lime–, moved onto some mojito thing the bartender made with cardamom (mmm), and then, as pictured above, had two sazeracs. For those who don’t know, the sazerac is considered to be America’s first cocktail, conceived in New Orleans in the 1830s, and features rye whiskey, bitters, and absinthe. This one was delicious. Before we dove into our burger and duck fat fries, we split an order of the “truffle lemon artichokes”–artichokes pickled in a lemon vinegar base with black truffles shaved in. Holy delicious artichoke. It was hard to pick one pickle over any other, but these were definitely a good choice–not too soft, not too vinegary, with an earthy bitterness from the truffles. 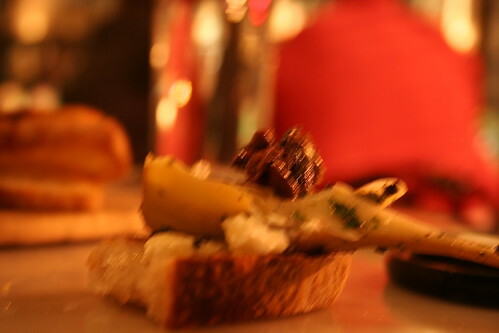 The photo is blurry because…well, I was into my 3rd drink of the evening at the restaurant and the lighting was super low. So bear with me. The artichoke was amazing, it just doesn’t look amazing. 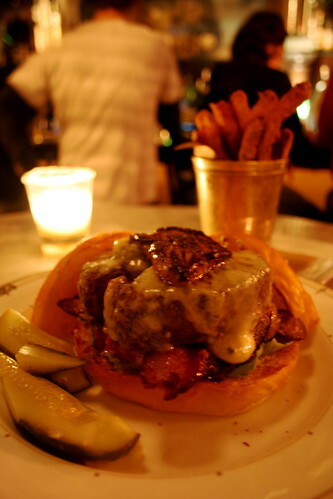 For the burger, we went as far as we could go: the Whiskey King & duck fat fries. Now the Whiskey King is so not vegan, so I understand if you give me hate, but, sorry, it was delicious. 8 oz of crazy fatty beef, maple bourbon glazed cipollini onions, rogue bleu cheese, thick cut applewood bacon, and foie gras. Yes: burger + foie gras. Holy, rich, meaty goodness. It is so worth the $26. Just split it with someone if you get it because, really, that much delicious animal is far far too much for one person. And the duck fat fries? They’re just as good as Anthony Bourdain promised. It was a good trip, a hella good trip, and, to be honest, I don’t miss the vegan Philly I knew before. Not that I don’t love the food I’ve had there before, but this trip tops them all–good food, a good show, good people, and some weird, preserved medical anomalies to boot. I could go back again soon, I think. that french toast looks incredible!